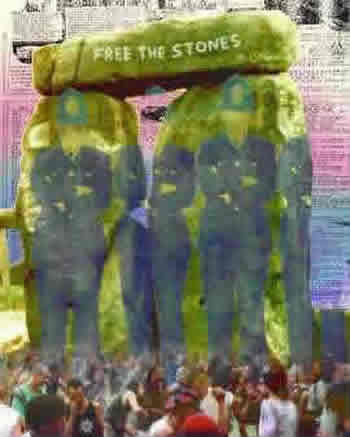 The historic summer solstice of 2000 I had seen estimates of anything from 10,000 to 100,000 as the expected turnout at Stonehenge for Solstice Y2K - the first time that these ancient stones would be open to the public in fourteen years. I had always cherished my childhood memories of clambering over these ancient stones, unencumbered by fences and unlittered by underpasses, a nearby carpark and the usual tourist facilities. The night was historic - a gathering of special people who had made the pilgrimage despite the accurate forecasts of cloud cover and rain. The stones were filled, and there were only a few cases of bad-vibers who never managed to change the euphoric mood of those assembled. For a change, the few would-be troublemakers were not in uniform. Many performance artists were there, with fire and drums and dance. The Samba Band, veterans of numerous direct action parties, were weaving their way with some difficulty through the crowd. It was not an organized event by any stretch of the imagination and more seemed to be happening at times outside the stones than within, where a large crowd stood, sat, and milled about. Sun finally made an appearance, cheered by the crowd, and continued with its blessing as blue patches raced across the sky. Arthur mounted a small stone around 7am to announce that we should start leaving soon, to meet the deadline. Penny continued piping, the band kept playing and the people continued to dance. As 7:30 came and went, a few more police entered the area, looking relaxed. One woman advised the uniformed ones that we were running a little behind schedule, to compliant nods. Arthur was starting to look a little nervous about the over-run but then the rain returned, bringing events to a close as we all departed, glowing with that privileged-to-have-been-there feeling.